Jansen AG is a Swiss-based family business that has been producing steel and plastic pipes for over 50 years. Starting from this year, the M-900iB/700 was used on the modernised extrusion line for the production of geothermal probes and has since halved handling times. In order to increase capacity and streamline production processes, Jansen has automated the handling of finished pipe bundles with the use of a robot. The robot places pipe bundles in a position, where complete welding can be done manually. The operator then inserts corresponding pipe ends into a plastic welding machine nearby, in which a probe foot is welded to the top and bottom end of the pipe. The robot then brings the bundle to the palletising station where it is secured. The largest robot in Switzerland is now in operation at Jansen AG. After the first contact with FANUC Switzerland, system integrator Robofact was contacted, who implemented the system, first in ROBOGUIDE and then with the company. Modernisation of the plant has boosted Jansen AG production and performance capacities. This has made Jansen AG a world record holder for Switzerland: nowhere else has more geothermal probes installed per square kilometre than in Switzerland. The model with the highest payload in its series can move 700 kg within its 2832 mm reach. From simple standalone solutions to fully integrated systems, FANUC has a robot for every application, be it gripping and placing, dosing, palletising, packing, transferring, loading or mounting. As the Swiss Federal Energy Administration's (SWF) program management reports on its website, there is nowhere else with more geothermal probes per square kilometre of land installed as in Switzerland - a barely known world record: and Jansen AG definitely, has a role to play in this achievement. The company supplies the required geothermal probes. To recover geothermal energy, a closed pipe system is sunk into the soil. The brine contained in the piping system (a mixture of water and antifreeze) is pumped deep underground, where it is heated up and sent back on the return flow. Heated brine is mainly used for heating and cooling purposes. The length of double pipes used for the process with a 40 mm diameter can easily reach 100 m, 250 m or longer. Wound up pipe bundles can weigh up to 350 kg. This steel pipe plant has been a family business for three generations. Plastic pipes have also been produced here for over 50 years. Both profiles and pipes in steel and plastic make up the business today, with the plastic segment taking a much smaller share of the production. However, as both segments keep growing, the concept of quality is prioritised throughout the whole production. Profiles for the construction sector and pipes for the automotive sector are the mainstay for steel. Jansen plastic pipes are mostly used for media transport, with a fair share being utilised as geothermal energy pipes. The most important materials are polyethylene and polypropylene. Production is carried out in 3-shift operation from Monday morning to Saturday morning. In order to increase capacity and streamline production processes, the extrusion line was modernised and the handling of finished pipe bundles was automated with the use of a robot last year. Its basic concept and the first layout were created by the project manager Manuel Frei, and the head of engineering Urs Brülisauer. Then FANUC Switzerland and system integrator Robofact came into play, agreeing on the concept and its implementation soon after. Up to then, Jansen AG had no experience of robotics in its own production. Brülisauer: “That was a pilot project for us in many ways. On the one hand, we have taken the first step in robotics with this future-oriented project. On the other hand, ergonomic aspects play an increasingly important role when we are planning new plants.” It was just as important that the design of the production “can retain a competitive edge in the near future” said the head of the engineering. FANUC M-900iB heavy-duty robot has a payload capacity of 700 kg and a reach of 2,832 mm. At Jansen, the handling of heavy pipe bundles is delegated to a robot, which halves the time that an indoor crane would require to complete the task. There were only a few specifications for the selection of the robot. The required load capacity was dictated by the task and the approximate range of reach by the plant layout. 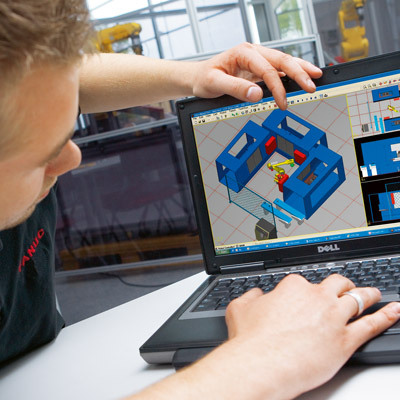 Manuel Frei: “We also wanted to have a standard, in order to meet the budget requirements for the project.” With this requirement profile, he contacted FANUC Switzerland. Michael Schüpbach, Sales Director responsible for robotics, got in touch with system integrator Robofact, who then implemented the system. The fact that the two companies, Jansen and Robofact are only a 40-minute drive from each other facilitated the cooperation, especially in the pre-acceptance and final acceptance stages. A heavy-duty M-900iB robot by FANUC with a load capacity of 700 kg and a reach range of 2,832 mm was installed at the plant. The gripper designed and built by Robofact is made in such a way that there is still a reserve available, even if a maximum 350 kg load is not centred. This makes sense because at the plant, in addition to standard lengths, custom-made products are also packaged, which is why it is important to maintain flexibility. It adapts during operation. However, the term “adapts” is not strictly correct. For example, if 40 mm diameter pipes are wound in different lengths between 50 and 400 m, it is only necessary to select an appropriate program on the system’s clearly arranged control panel. Everything else is stored in the programme. If other diameters are required therefore it only needs to be changed from 40 mm to 32 mm, the system has to be converted from the extrusion line to the winder. Duration: two to two and a half hours, with retrofitting of the extrusion system taking most of the time. The winder itself and the automation creates different diameters without modification. Without a carrier roll, plastic pipes coming from the extrusion line are wound as a double strand and cut to order. The beginning of the new pipe section is directed to the second winding station. When at the winding station, the pipe bundle is fixed with packing strips and then rolls from the winding station to the robot into a pre-defined position. The robot grips the roller and pivots it into the position where complete welding is done manually. In an adjacent welding machine, the probe foot, which is essentially a U-shaped part, is welded to the downward end and the beginning of the upward leading pipe. For this purpose, the operator inserts corresponding pipe ends into the plastic welding machine. While nothing has changed in the welding process itself, the robotic automation has reduced the handling time at this point from 15 to around seven minutes. A customary manipulation with an indoor crane used to be much more complex. Once the probe foot is welded on, the end of the double pipe is re-connected and the robot brings the finished bundle to the palletising station, where it is secured with shrink wrap. However, plant construction and programming were comparable to smaller plants. A complete movement profile of the robot was simulated by Roboguide. “Accessibility for manual operations was a big issue in the design process,” says Egli. However, to prevent “cold deformation” of the safety guard, robot specialists at Robofact devoted themselves to the topic of “safety” very intensively. The cubicle is protected by light barriers and a floor scanner. A white light indicates to the employees that access to the work area is free. “With our chosen solution, we can use our staff much more efficiently,” concludes Brülisauer. “We have become faster and more efficient.” Just with the introduction of a double-strand system, higher production capacities were created. In addition, the throughput in the extrusion section has been significantly boosted with the new equipment. However, the robot speed is limited to 60% after the initial trials at maximum speed as the handling times are hardly reflected in the cycle time anyway. Total automation has also reduced personnel expenses. The savings potential lies mainly with shorter lengths, because here the share of manual operations is greater. The amortisation will take three to four years. One thing is already clear: “With the entire plant, we were able to take a big step forward in the development of this production,” says Manuel Frei. Above all, this concerns the plant's production capacity and efficiency. “The right products, efficient equipment, high quality and proximity to the market” are the building blocks of success for Brülisauer." The gripper designed and built by Robofact is made in such a way that there is still a reserve available, even if a maximum load of 350 kg is not centred.